STRASBOURG, France - The wide-spread and intense manhunt for the gunman who killed three people and left several others injured in the eastern French city of Strasbourg on Tuesday, ended with the man's death. The gunman, who was identified as 29-year-old Strasbourg resident and native Cherif Chekatt carried out a shocking attack at one of Europe's most famous Christmas markets in Strasbourg on Tuesday evening, killing three people and leaving 12 others injured, before fleeing the scene. 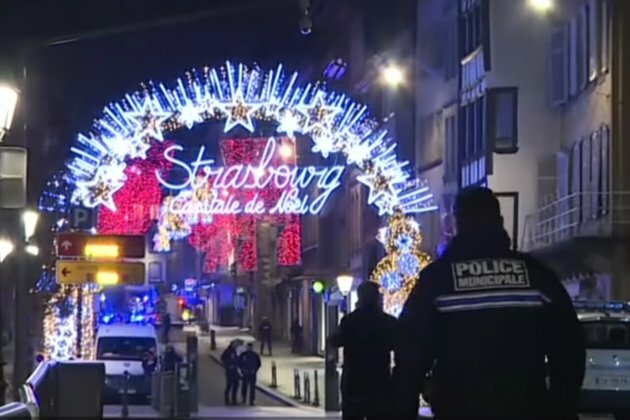 The attack triggered a massive security operation, as part of which, the entire city of Strasbourg was placed under lockdown as a massive manhunt was launched for the suspect. Subsequently, the French government raised the security alert level and sent police reinforcements to Strasbourg. The manhunt, which started on Tuesday night, continued over the next two days, with about 350 security forces searching for the assailant and five people associated to the suspect, being detained. The suspect, who was identified by the French police union officials, was said to be a suspected Islamic extremist with a police record in France and Germany. Officials had stated that Chekatt had suffered injuries during a gunfight with soldiers after the attack, but had managed to escape. A search for the suspect was also launched along the German border, since Strasbourg is on the border with Germany. On Thursday, a Paris prosecutor told reporters that the gunman was shot dead in a brief gun battle with police after being on the run for 48 hours. The country'sInterior Minister Christophe Castaner confirmed the same in a tweet later, and shared more details of how the incident unfolded. Castaner tweeted that police officers spotted a suspicious individual on Rue du Lazaret around 9 pm on Thursday. The individual reportedly fit the description of the suspect from Tuesday night's shooting. Castaner wrote that after the officers addressed him, thesuspect turned around and opened fire at the officers, following which they responded and the suspect was brought down. Police officials have revealed that the suspect was armed with a pistol and a knife. The senior Interior Ministry official Laurent Nunez revealed that Chekatt was wanted on an attempted murder charge in relation to a botched robbery. Earlier, the Paris prosecutor, Remi Heitz revealed that witnesses reported hearing the gunman shout 'Allahu Akbar' (Arabic for God is great) during the attack. Heitz said, "Considering the target, his way of operating, his profile and the testimonies of those who heard him yell 'Allahu Akbar,' the anti-terrorist police have been called into action." On Thursday, the prosecutor said thatChekatt had escaped the scene in a taxi after opening fire at the packed market. Later, the U.S.-based SITE Intelligence Group, which monitors extremist activity and online communication globally, said that the Islamic State Militant group's Amaq news agency claimed in a statement that Chekatt as a "soldier" of the group. ISIS reportedly said Chekatt was one of its soldiers, who "carried out the operation in response to calls for targeting citizens of coalition countries" fighting the militant group. While the group provided no evidence for the claim, SITE added that ISIS supporters celebrated the shooting online following Tuesday's attack. Reports noted that Chekatt was the subject of a fiche S which is an indicator used by French law enforcement to signal potential national security threats. The suspect is said to have spent time in French, German and Swiss jails for a theft and violence. The senior Interior Ministry official, Nunez told reporters on Thursday that Chekatt had been radicalized in prison. He was reportedly being monitored by French intelligence services since at least 2015 due to his suspected religious extremism. Commenting on Thursday's operation, Strasbourg Mayor Roland Ries told reporters, I think it will help to get back to a life that I would describe as normal. With the death of this terrorist ... citizens, like me, are relieved." Meanwhile, in a post on Twitter, the National Police of the North thanked the public for information which helped "find the wanted individual." The Paris prosecutor's office said that two people were killed in the attack on Tuesday, while a third person, who was one of the five seriously injured in the attack has been declared brain-dead on Thursday. Three others who suffered injuries in Tuesday's attack, remain in a serious condition.